The Atlas-III-Z8 System-on-a-Module (SoM) is an advanced high performance heterogeneous computing architecture on a module that fits in the palm of your hand. 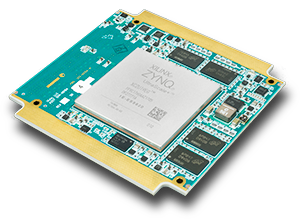 Featuring the 16nm Zynq UltraScale+ Multi-Programmable System-on-a-Chip, the Atlas-III-Z8 combines a quad-core 64-bit ARM CPU architecture with abundant programmable logic resources, including over 3,000 DSP blocks. A wide bank of high speed DDR4 memory is dedicated to the programmable logic to support demanding image/video and signal processing applications. As with all of iVeia’s Atlas SoMs, the Atlas-III-Z8 is designed and built for reliable operation in harsh environments and is fully compatible with all Atlas-compliant baseboards. The flexible Atlas architecture allows for system scalability in performance, I/O, size, and power, and provides a migration path between differing technologies and future Atlas modules. The Atlas-III-Z8 supports iVeia’s Velocity-HF™ heterogeneous framework that accelerates development time by up to 50% or more and provides an application portability layer between different modules and processor technologies. Also offered are iVeia’s RTL-optimized libraries for signal processing (Velocity-SDR™) and video processing (Velocity-VIP™).